Part of 3D printing’s popularity is due to its potential for creating custom shaped items –designed to your exact specifications. This has made 3D printing the perfect means for creating a 3D printed guitar pickup. 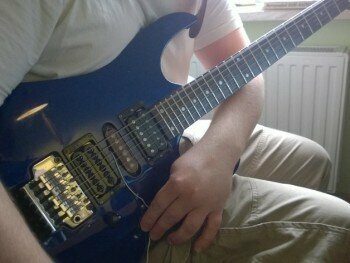 Polish designer Rob Klaczynski, together with his guitarist friend Martin Kubacki, have used 3D printing to produce the world’s first 3D printed guitar pickup. While instruments have already been 3D printed, it’s the first time that an electric guitar pickup has been made with a 3D printer. A guitar pickup is an essential element for electric guitars. It is mounted on the electric guitar and used to capture the vibration under the strings and then convert them into electric signals that then come out of the amplifier and speakers. The pickup consists of a coil and magnetic core. Martin and Robert printed the guitar pickup on their 3D printer, and then uploaded the project instructions and files to Thingiverse for others to print, use, and enjoy as well.